Has your company come to a stand still? Are you not able to produce any profits or conduct business anymore? If your company is no longer functional, and you have exhausted all your options to continue operating it, then you might decide to deregister it. But before you can do that, you would have to check if your company has any debts or liabilities, which has to be taken care of prior to the de-registration of your HK company. Why choose to de-register your HK company? It has failed to carry any sort of business. It is not able to earn any profit. The company is not able to pay of its debts. There is a fallout between the shareholders of the company. The statutory obligations were not complied with, which includes the mismanagement of company affairs and many others. There is a corporate restructuring of the association that owns the company. If any of the cases is true for you, it is better to close your company. The process of closing a company in Hong Kong is called “liquidation.” There are two ways of closing a company, one is by winding it up and the other is done through the deregistration process. And although both the processes lead to the closing of a company, they follow entirely different methods. Here, we will cover the de-registration of an HK company. For a company to be deregistered with the government, it would have to be a defunct solvent and a private limited or limited by guarantee company. A company is said to be defunct when it is no longer functional. And it is said to be solvent when the business does not have any liabilities or debts and can be closed easily. Basically, before you can close your company, you should be clear from any legal issues and debts. Other than that, it should no longer be operating or earning any profits. Every member of the business approves for the deregistration. There is no outstanding liabilities in the company. There isn’t any legal proceedings of the company. The assets of the company does not include immovable property in Hong Kong. The business operations have not yet started in the company; or the company has not been able to operate for at least 3 months before the application is submitted. The company has received the Notice of No Objection (NNO) from the IRD so that it can be deregistered. In this step, the company would need to receive the No Objection Letter from the Inland Revenue Department. To get this, you need to properly file for de-registration and then give it to the Commissioner along with the fee for the de-registration of your HK company. As a matter of fact, if your request is declined or you change your mind to not close your business, you would not be able to get the fee back, as it is non-refundable. The form NDR1 that is properly completed. The original copy of the “Notice of No Objection” that was obtained from the IRD’s Commissioner. Any additional document that the CR can request that is in connection to deregistering your company. The CR would check all the documents you send and if everything is in place, the documents would be processed and you would get the Letter of Approval to deregister your business. If no objection is received, the CR would then announce a final notice that they would be proceeding with the de-registration of the HK company in the Gazette. Additionally, the company in question would also be informed about the decision of the CR. After the announcement, the company would be finally dissolved. The complete process of the de-registration of your HK company usually takes about five months to complete. As soon as the company is liquidated, the assets of the company (including the bank balance as well) would be considered as bona vacantia. In short, it would be acquired and held by the Special Administrative Region of the Hong Kong Government. NOTE: It is advised to take the help of a legal advice for properly disposing the assets of the company before filing the application. When the company is closed, it is crucial to inform the IRD’s Business Registration Office about it within one month of the approval. This is done to cancel the Business Registration. Before you receive the approval for the de-registration of your HK company, you would have to continue fulfilling all the legal obligations like paying the taxes and filing the Annual Returns. In short, you would have to perform your duties according to the Companies Ordinance, else your business would be subjected to prosecution. You can check the updates put up by the CR on the Gazette Notice board at www.gld.gov.hk/egazette. If the address of the applicant has been changed before the de-registration of your HK company is complete, you would have to let the CR know about it. For this, you would have to give a letter to the CR to make communications easier for the future about your company. If the registered office address of your business changes or the address of the directors change, you would again have to fill a form to let the government know about it. The form to be filed is the Form ND2B. In case an aggrieved party, such as a creditor, wants your company to be restored after you have de-registered it, then they would take the help of the IRD. Also, the person would need to submit an application to the Court of First Instance. This is to restore the business by agreeing to the Companies Ordinance section 765 (2). For directors or members of a company, this process does not work. On the contrary, if you were a member or director of the company and want to restore it within 20 years of its dissolution, you would have to apply for the Administrative Restoration. To be able to apply for the administrative restoration, the name of the company should have been removed from the CR and the company should have been dissolved after it. As a matter of fact, the dissolved company cannot be restored through administrative restoration. 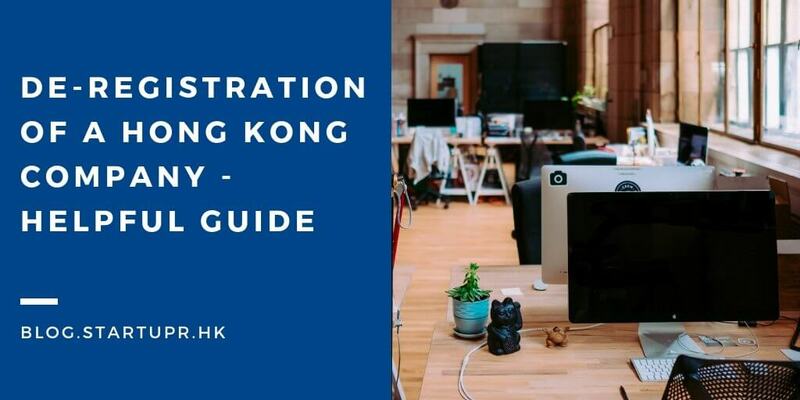 With the steps and information shared above, you now know all how to complete the de-registration of your HK company and when you should do it. Just ensure that you follow all the rules strictly. Also make sure that your company is at the state where you are not able to earn any profit and there is no use of running it anymore. Other than that, it is highly recommended that you engage a professional agency like Startupr to help you in timely assistance and proper guidance. Contact us to know more details!